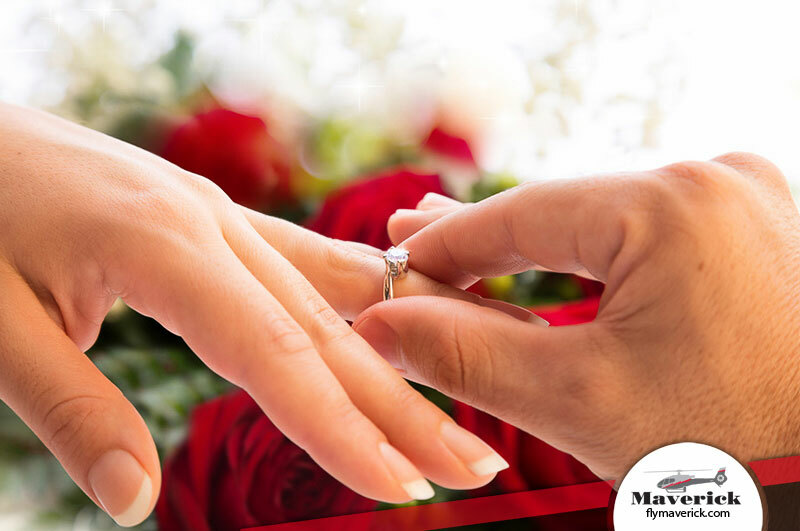 Call our in-house wedding coordinator at 702-948-1325 to plan your marriage proposal. All proposal packages include: private helicopter, round-trip limousine transportation hotel to hotel, all fees, gratuities and champagne toast. Terms: Deposits are not required. Full payment will be due 10 days prior to your flight. Contracts and credit card authorization forms will be required for confirmation. All cancellations will be fully refunded with a 48 hours written notification. 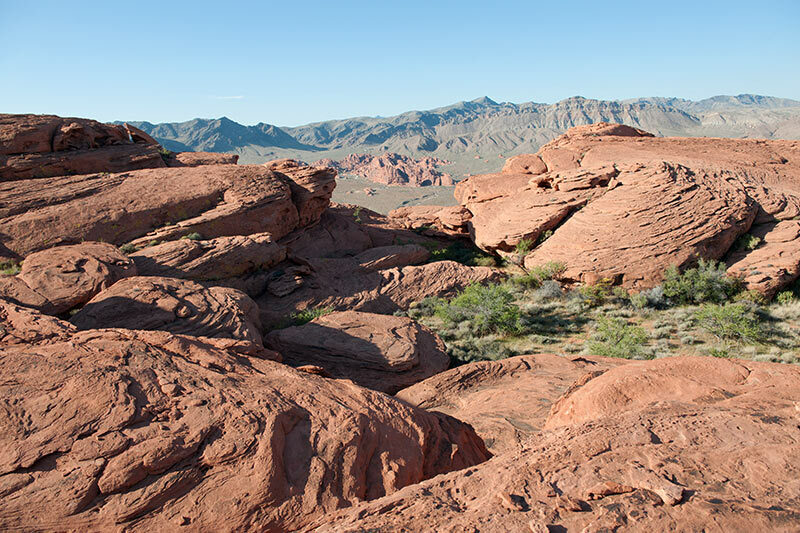 Land on a private bluff overlooking the Valley of Fire for your proposal. After your proposal, you will make a second journey above the city's iconic landmarks such as the Bellagio, Caesars Palace, Stratosphere Tower, Eiffel Tower, historic downtown and more! 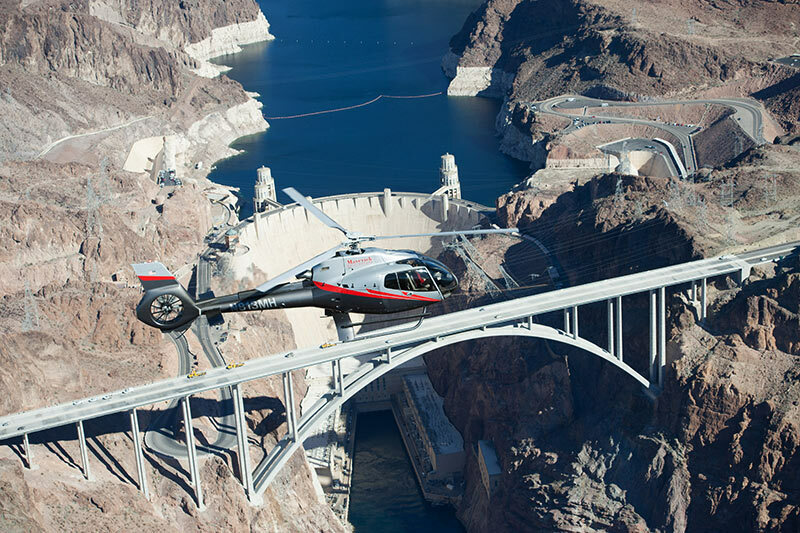 Your adventure will begin with a bird’s-eye view of the world famous Hoover Dam followed by a breathtaking flight over and through the Grand Canyon. Continue your experience as you soar high above the Valley of Fire and Hidden Valley where you will admire spectacular red sandstone formations and some of the most fascinating desert landscape found anywhere. You will then land on a private bluff overlooking the Valley of Fire for your proposal. Enjoy champagne, beverages and hors d’oeuvres as you take your amazing photos in front of this one-of-a-kind backdrop. 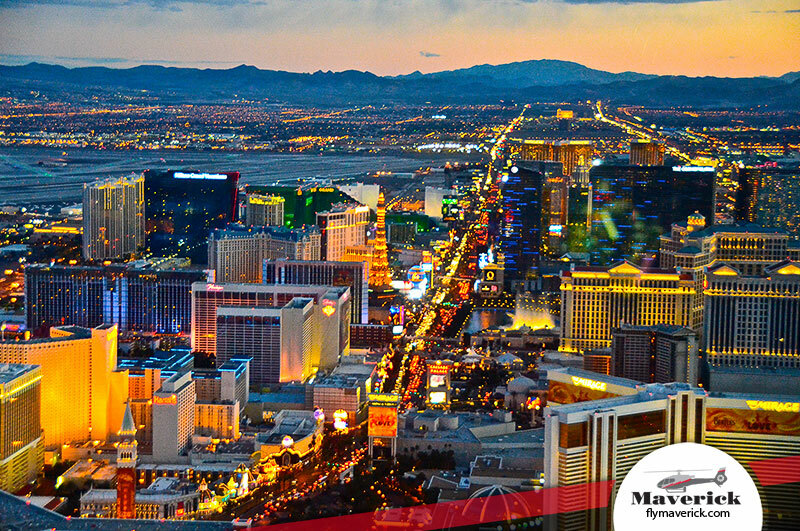 Enjoy the sunset as your journey finishes with an exciting flight over Downtown Las Vegas and the Las Vegas Strip as the lights of the city come to life. The day was just perfect! We are so happy with our experience! The pilo... The day was just perfect! 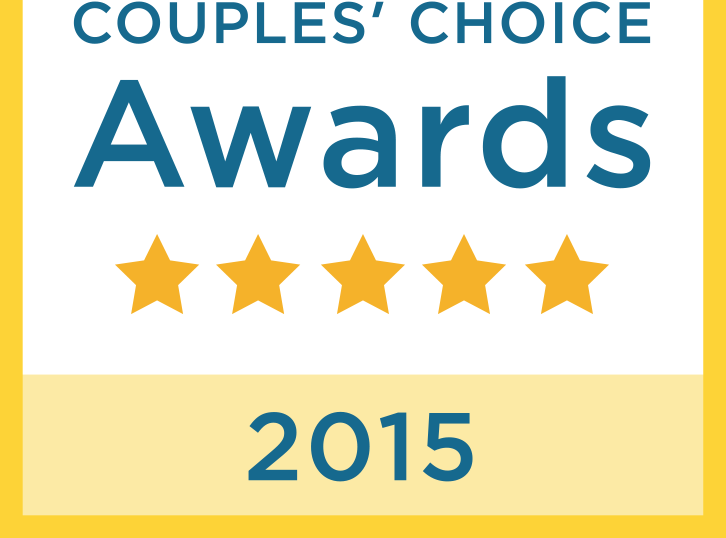 We are so happy with our experience! The pilot was a great tour-guide and an all around great guy. The whole experience was excellent and we couldn't ask for a better group and day. We can't thank you enough for all your help in coordinating our wedding and w... We can't thank you enough for all your help in coordinating our wedding and we were extremely pleased with choosing the Maverick Helicopter Wedding package. How lucky we were to have a wonderful flight, Terri the officiant who performed the lovely ceremony and Amanda for capturing all the beautiful views in making our special day so memorable. We couldn't have asked for a better day, the weather was perfect and we will cherish every moment for the rest of our lives. Cameras: It doesn’t matter whether you have a disposable, manual or digital camera. Just be sure to bring the one you’re used to shooting with—along with some spare batteries. Large-format, Polaroid or video cameras are also fun to try out and can provide different perspectives of the landscapes. Film: If you aren’t using a digital camera, you may want to have a couple of types of film on hand. Generally, film is given an ASA or ISO speed rating between 100 and 800, based on its sensitivity to light. Higher numbers are better suited to landscapes where these isn’t much light. You’ll want to use a 100-speed film during the brightest daylight hours. If you’re shooting in the morning or early evening, a 400-speed film is the better choice. TIP: Black and white film can make for remarkable pictures at these destinations. Lighting: Strong, direct sunlight can wash out a landscape. Sometimes it’s better to photograph during sunrise or sunset, when the light is softer—plus, you’ll capture deeper shades of red and orange in the rocks. TIP: You may want to use your flash for evening shots—when photographing people or wildlife. A flash can also fill light in some of the darker, shadowed sides of the canyons, rock formations or dam. Composition: Though landscape shots seem like a cinch, they are quite tricky. Generally, the faster your shutter speed, the more detail and sharpness your photo will have. You also might try framing a distant scene with a strong foreground object—a tree, rock or person. Just make sure you are standing only an arm’s length away from it. This technique lets you spotlight the distant background and creates a three-dimensional effect. Stability: With helicopters, there is often vibration and movement due to the engine and rotor blades. Professional photographers usually have a VR (vibration reduction) lens to address this issue. The best thing you can do is to try not to let any part of your arm touch the frame of the helicopter while you’re shooting. Patience: When you visit these remarkable destinations, almost every moment—24 hours a day—is a photo opportunity! So relax and don’t worry. You’ll have plenty of chances to get a great shot. In fact, the opportunities are so abundant they’ll reveal themselves at every dip and turn of the helicopter. There are hundreds, if not thousands, of reasons to visit the Grand Canyon. Being the largest National Park in the United States, you can hike, raft, picnic and many other things. Here are some reasons we would like to share. The Grand Canyon is one of the seven natural wonders of the world—and it’s a lot easier to access than some of the others, like Mount Everest, the Parícutin Volcano and the Great Barrier Reef! More than five million people visit the Grand Canyon National Park each year. This many people can’t be wrong! No photograph or verbal description of the Grand Canyon is ever going to suffice. You just have to experience its overwhelming vastness and awe-inspiring splendor in person. A visit to the Grand Canyon is an iconic American experience. This is because the Grand Canyon National Park is among the oldest in the U.S. It was named the country’s 17th national park by President Woodrow Wilson in 1919. The Grand Canyon certainly proves the adage that bigger is better. Did you know the Grand Canyon National Park encompasses a whopping 1,217,403 acres? Plus, the canyon itself is a mile deep and averages 10 miles in width. The Grand Canyon isn’t just old—it’s really, really old. It’s estimated that the Colorado River carved the canyon out during the past six million years. And there are rocks in the Grand Canyon that have been found to be two billion years old (i.e., that’s almost half of the Earth’s life span!). You could say, like a fine wine, the Grand Canyon is only getting better with age. The Grand Canyon is rich in history. Researchers have uncovered more than 4,800 archeological sites that bear the echoes of ancient Indian tribes. Current evidence from artifacts suggests that humans have inhabited the Grand Canyon as far back as 4,000 years ago and journeyed through it for 6,500 years before that. The Grand Canyon is also rich in wildlife. Have you every heard a coyote howl? Have you seen a mule deer relaxing in the sun? Have you spotted a great horned owl perched in a tree? Moments like these are common in the Grand Canyon—and perfect for those who like to snap photos. Speaking of photos, if you’re a person who prefers looking at pictures to reading, then you’ll enjoy checking out all the petroglyphs (pictures that are etched into the walls) and pictographs (pictures that are painted on the walls) at the Grand Canyon. Do you ever get stressed out from your urban lifestyle—all the noise and nonstop activity? At the Grand Canyon, there’s a beautiful silence and stillness that will literally engulf you. Sunrise and sunset are spectacular at the Grand Canyon. They are dramatic presentations as good as any you’ll find in the theater—and there isn’t a bad seat in the house! There’s access for all here! The Grand Canyon National Park makes visiting its major attractions easy for travelers with disabilities. You’ll find handicapped-accessible bathrooms, showers, campsites, guest rooms and parking lots. Maps at the entrances to the park will outline all of the facilities and services available. Several one-of-a-kind events are held at the Grand Canyon. In September, you can enjoy the Grand Canyon Music Festival on the South Rim and in August, Native American Heritage Days is celebrated on the North Rim. Plus, there’s plenty of holiday cheer spread at Christmas and scares to be had on Halloween! The Grand Canyon is the perfect place to take in a true whiff of fresh air. In fact, your olfactory system is sure to be thrilled by the sweet scents of the Ponderosa pine, aspen and fir trees. Don’t think the only colors you’ll see at the Grand Canyon will be desert hues of brown. There are approximately 650 types of wildflowers found in the Grand Canyon National Park. Throughout spring and summer, lots of pretty flora are in bloom—including yellow ragweed, pink toadflax, red Indian paintbrush and purple Rocky Mountain iris. And the Colorado River isn’t the only running water you’ll observe at the Grand Canyon. There are stunning waterfalls cascading for hundreds of feet—including Havasu Falls on the Havasupai Indian Reservation and Ribbon Falls on the North Rim’s Kaibab Trail. How many people can claim to have ridden a mule? If you’re not afraid of heights or animals, you can actually saddle up for a bumpy and breathtaking ride down into the Grand Canyon. Like mule rides, there are endless possibilities when it comes to experiencing the Grand Canyon. The athletic and adventurous can choose from hiking and rafting. And those who may not be major outdoor enthusiasts or have a lot of time for a lengthy visit, can enjoy sightseeing on a Grand Canyon helicopter tour—such as those offered by Maverick Helicopters. No one ever leaves disappointed or forgets their visit to the Grand Canyon! So what exactly do you know about the famed rocky gorge located in the Arizona desert? For trivia about the Grand Canyon—one of the biggest and most interesting examples of erosion in the world—read here! The Grand Canyon National Park covers 1,904 square miles (or 1,217,403 acres) and includes an extensive system of tributary canyons. The highest points at the Grand Canyon are found at Point Imperial on the North Rim, which is 8,803 feet high, and Navajo Point on the South Rim, which is 7,498 feet high. Compare this to the elevation of the lowest point at Phantom Ranch on the bottom of the canyon floor—which is 2,400 feet high. The Grand Canyon averages 10 miles across in width. Its narrowest point is in Marble Canyon, where it is 600 feet wide. Its maximum width of 18 miles is found at several different points. The greatest depths of the Grand Canyon lie just over one mile beneath its rim. The volume of the Grand Canyon is estimated to be 5.45 trillion cubic yards. The total length of the Colorado River is 1,450 miles. Within the Grand Canyon, it measures 277 miles from Lees Ferry to the east Grand Wash Cliffs, which is located near Lake Mead in Nevada. Grand Canyon Facts. 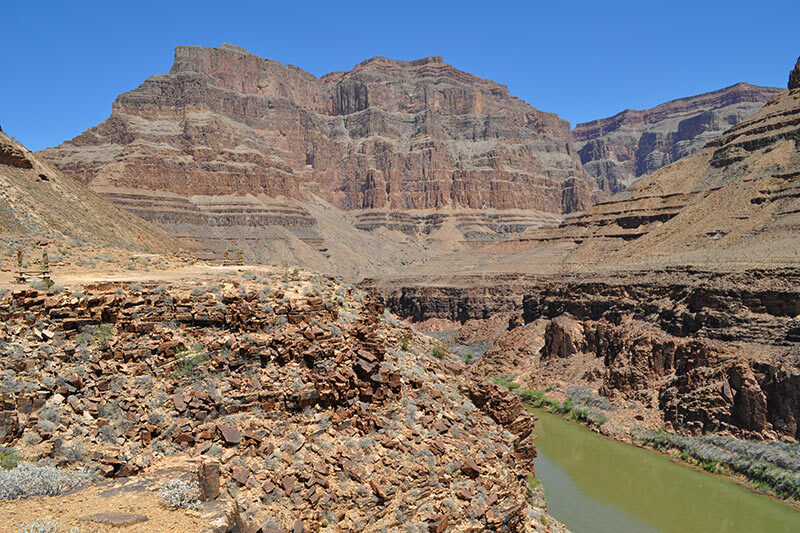 Speaking of the Colorado River, its average width in the Grand Canyon is 300 feet—with its narrowest width being 76 feet. The river’s average depth is 40 feet, while its greatest depth is a harrowing 85 feet! There are 373 species of birds, 91 species of mammals, 57 species of reptiles and amphibians, 17 species of fish (this number has dropped quite a bit in the last decade!) and more than 1,700 species of plants located in the Grand Canyon National Park. There are also 8,480 known species of invertebrates—i.e., critters that don’t have an internal skeleton—at the Grand Canyon. The Grand Canyon National Park has recorded more than 4,800 archeological sites—and it has only surveyed 3% of the park’s total area! There are nine buildings at the Grand Canyon National Park that are listed as National Historic Landmarks. Grand Canyon Village, which consists of 257 properties, is also listed as a National Historic Landmark District. More than five million visitors are coming to the Grand Canyon annually. Recent statistics show visitors roll into the park in 1.5 million cars and 30,000 tour buses. Also, 238,380 of them come by the Grand Canyon Railway and nearly 750,000 more arrive via small planes and helicopters. Back in the 1920s, the average visitor would stay at the Grand Canyon for two to three weeks. Today, the average person spends about three to four hours at the Grand Canyon—often shortening their transit time hugely and enhancing their views by taking a Grand Canyon helicopter tour! The oldest signs of a human presence at the Grand Canyon are some spear points dating back to 10,000 BC. They were made by Paleo-Indian hunters. From about 500 BC various bands of Native Americans occupied the Grand Canyon region. They hunted in the forests, farmed and constructed cliff dwellings. Among the first of these were the Cohonina, Cerbat and the Anasazi, followed by the Navajo, Paiute and Hopi. Many of these were ancestors of today’s Hualapai and Havasupai tribes. Spanish adventurers arrived at the Grand Canyon nearly 80 years before the Mayflower set sail. The first sighting is credited to the expedition of Francisco Coronado in 1540. His group of soldiers was looking for the fabled Seven Cities of Cibola. In 1848, the signing of the Treaty of Guadalupe Hidalgo ceded the Grand Canyon region to the U.S.
Jules Marcou of the Pacific Railroad Survey made the first geologic observations of the Grand Canyon and its surrounding area in 1856. The first attempt to explore the Grand Canyon came in 1857. Lieutenant Joseph Christmas Ives had to report to the War Department on whether the Colorado River was navigable by steamboat—and it was! The name “Grand Canyon” was first used on a map in 1868. It was popularized by Civil War veteran John Wesley Powell, known as the “one-armed explorer” because he’d lost one of his arms to a musket ball. Powell had brought a 10-man team on his Colorado River Exploring Expedition in 1869. In the 1870s, greedy miners began to stake claims in the Grand Canyon. They had hoped previously discovered deposits of copper, lead and zinc would reap profits, but gave up their effort due to problems accessing the canyon and removing the ore. In the 1880s, the arrival of the Atlantic and Pacific Railroads to Flagstaff and Williams brought tourists trickling into the Grand Canyon area. (Note: By 1901, the Santa Fe Railroad began running from Williams all the way to the South Rim!) Grand Canyon History. In 1883, President Benjamin Harrison established the Grand Canyon as a national forest reserve, which offered it some environmental protection—although logging and mining were still allowed. In 1902, journalist Winfield Hogaboom drove with three of her friends in the first car to arrive at the Grand Canyon. President Teddy Roosevelt stood at the rim of the Grand Canyon in 1903. In his speech, he described it as “one of the great sights which every American if he can travel at all should see.” In 1908, Roosevelt proclaimed it the Grand Canyon National Monument. In 1919, the Grand Canyon National Monument was upgraded to the Grand Canyon National Park by President Woodrow Wilson. The Fred Harvey Company built Phantom Ranch, which is located on the Grand Canyon’s floor alongside the Colorado River, in 1922. Trains were the preferred way to travel to the Grand Canyon up until the 1930s, when cars surpassed them. In 1975 the Grand Canyon National Park was expanded under President Gerald Ford to include the Marble Canyon National Monument. In 1979, the Grand Canyon was designated as a World Heritage Site. Most recently, in 2000, President Bill Clinton created the vast Grand Canyon-Parashant National Monument. It totals just over one million acres and protects the land located off its North Rim. This newer monument is nearly the same size as the adjacent 1.2 million-acre Grand Canyon National Park. 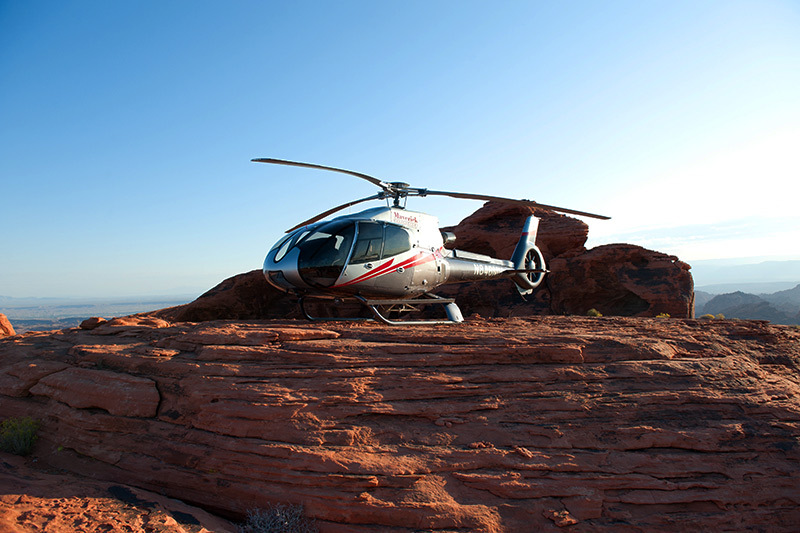 Experience this historical wonder with a Maverick Grand Canyon Air Tour.